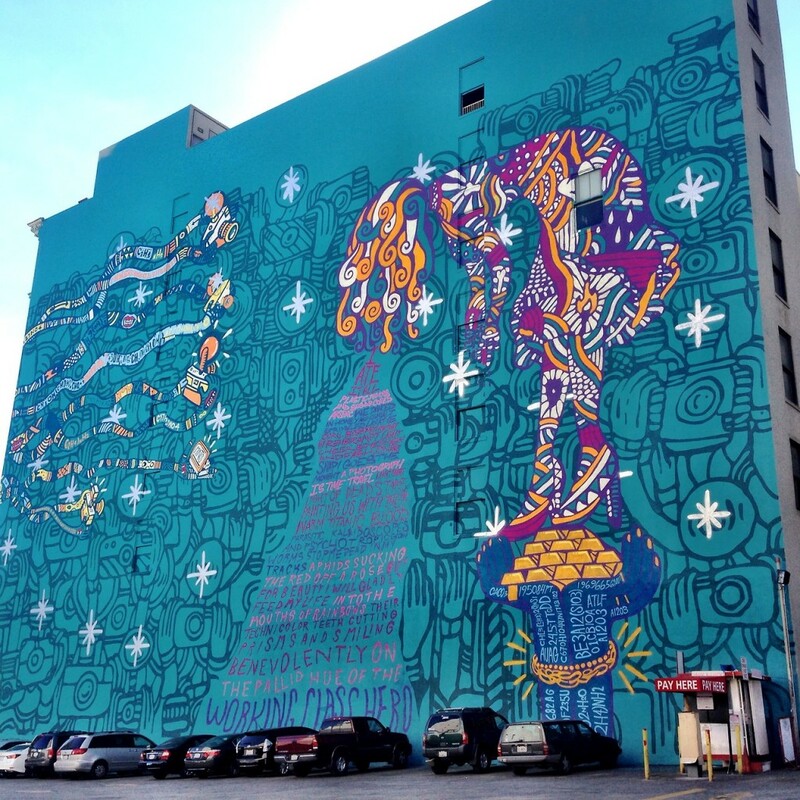 So Foster The People‘s album dropped this week after a whole three months of rah-rah on their YouTube channel (and a mammoth 148ft x 126ft mural in LA). The indie pop trio broke into the global scene back in 2011 with their debut single “Pumped Up Kicks” (you know… the one with the whistling), and left a string of radio-friendly singles before disappearing completely for 2 whole years. The band’s psychedelic, rock-tinged tunes made waves worldwide with their debut, and their then-fresh-faced glory did not go unnoticed here at Popspoken, as seen from this #throwback article from our archives. I picked up their sophomore album from HMV Marina Square (all hail the most reliable CD shop in SG) for just $19.90, with its stunning album art in all its blue-hued, trippy glory. The cover depicts a “supermodel vomiting poems… in a back alley”, while “paparazzi capture her at her weakest moment”. Side note: it’s also how I would imagine a repackaged version of Maroon 5‘s “Overexposed” to look. The concept album is a cutting take on the world’s capitalist and consumerist culture, with heavy lyrics laden on light, organic instrumentals. Yes. Organic instruments. 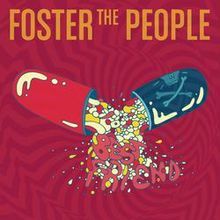 This is definitely not the Foster The People I’m used to from their “Torches” era; where their heavy synths and vocal mastering made them rather similar to contemporaries such as fun.. So here I am sitting at home in front of my laptop, about to delve into the 11 tracks of LSD-infused cynicism that is their second offering. Join me as I enter a no-holds-barred commentary of this compilation while resisting the after-effects of post-lunch food coma. [Track 1: Are You What You Want To Be?] Oooo. Great starter track! Love the oom-pah rhythm in the verse that adds an air of 1920’s sophistication to the infectious ‘pop’ chorus, complete with a “na na na” hook that One Direction would love. [Track 2: Ask Yourself] Starting off the second track off the album with a REAL INSTRUMENT (acoustic guitar) already marks their departure from their debut’s synthpop genre. Wow Mark Foster really sounds like Adam Levine here. Weird. Also, I can’t explain it but this song is “Topshop Music”, if you get what I mean. [Track 4: Never Mind] Amazingly chill guitar/drums intro. THIS IS MY FAVOURITE ONE SO FAR. I JUST LOVE IT. Even the title gives off an air of “bo chup“-ness (recklessness). [Track 6: The Angelic Welcome Of Mr. Jones] Continuing the roll of Queen-like ear biscuits, this short, bizarre 33-second clip of airy multi-track voices is um… the audio equivalent of a theatre intermission, I guess. [Track 7: Best Friend] Okay the drums are here and now we’re back to the “Topshop Music” feel. Dreamy, faraway vocals over tireless drumbeats. Nice. I swear there are cartoon sound effects in this song… that sound when you’re supposed to notice an obvious object placed right in the foreground in Blue’s Clues? I can definitely see why this is the latest single: it’s growing on me already! For some reason, I keep having flashbacks to “Houdini”, the last single from their previous album. [Track 8: A Beginner’s Guide To Destroying The Moon] Honestly the rapid, trance-like clips that start this track got me worried and for a moment I thought the file was corrupted. This song sounds… angry. 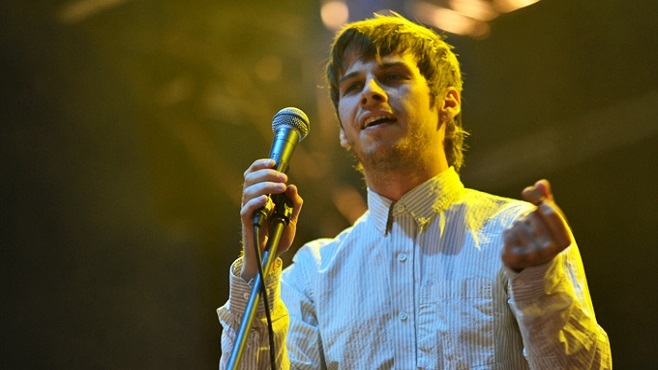 But that’s basically the theme of the whole album, according to frontman Mark Foster himself. [Track 9: Goats In Trees] Well, THAT’s an image that’ll follow me every night this week. The stripped-down strumming guitar/voice pairing makes this sound a bit like the crooning of a lonely, possibly senile farmer stuck in the middle of a long drought. 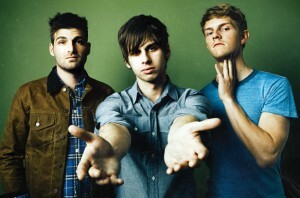 Also, Mark Foster’s lower range can be very creepy (Think Slenderman). It also doesn’t help that this bass drop happens on the lines “Pleased to meet you/Excuse my hands/I’ve been bitten by an enemy that’s pretended to be my friend”. OKAY SO THE SONG ENDS WITH REPETITIVE, GHOULISH BABBLE AND I AM NOT OKAY, OKAY? Mark this down for the next Paranormal Activity soundtrack. [Track 10: The Truth] Back from therapy and I’m ready for the next track. Mark’s voice in the first verse sounds a bit like a drugged-out Lana Del Rey… if Lana could sound more sedated than she already is. This track has a really, really nice beat but lacks a strong, memorable chorus — something like Florence + The Machine while on writer’s block. Admittedly, the experimental, through-composed songwriting technique disposes of the need for a thumping refrain. [Track 11: Fire Escape] Quiet, plucked guitar backing multi-track vocals. Very calming if you ignore the lyrics, which name-check Los Angeles, calling for the city to “save yourself” and to “pick yourself up and change”. This sums up the whole album perfectly: an understated, subtle cry that may border on preachy, but beseeches you to sit up and listen. Not to plainly hear; whether searching for a good hook or surrendering to a beat, but to listen. “Supermodel” is dreamy yet concrete, light yet dark. 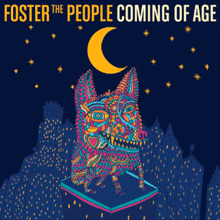 This studio effort encapsulates the paradox that is Foster The People itself. As an indie pop band how are they supposed to approach the market, and themselves? 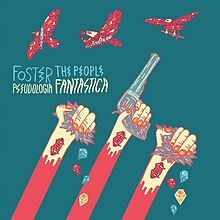 By championing a cause (instead of some pretentious verses), in this case, mindless consumerism, Foster The People have managed to retain the “perfect pop record” sound they’ve hoped for, without becoming soulless slaves to the charts. Buy Supermodel on iTunes HERE. Physical copies available at all good (subjective) CD shops islandwide.